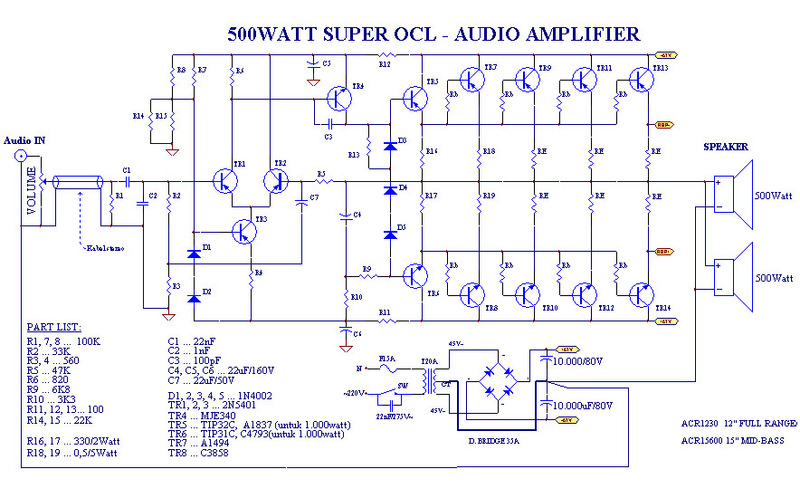 This amplifier Super OCL 500watt RMS with a maximum power supply voltage at the load 45vct 2x speakers. PA3600w on par with other assemblies amplifier. Transformer with a current strength of at least half of the nominal voltage, to compensate for a 4-ohm load 2x (4x speakers) such as stereo amplifiers professional standards, eg transformer 40Vct 20Amper. 40vct minimum supply voltage, if rectified would be more than 50vdc, transistor-power transistors will release energy (more life) if it supplied with 50Vdc voltage (40vct = vac). 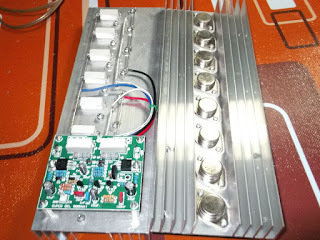 2x 500watt (12 ", 15") per mono block amplifier, speaker total 4 units to 1 stereo amplifier. is more effective in improving the gain of using a large speaker> 1.000Watt (18 ", 21") with the least amount. Suggested use Sanken series 3 sets. 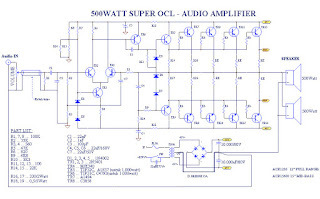 Too many final transistors without increasing the power supply transformer can weaken the thump of the bass and the sound is less stable, hoarse etc. Carefully series Sanken many forgeries, for example, Sanken 2SC2922-5DY (quality is unstable and does not correspond to the price). Transistor driver must also be original! If there is a problem such as a hoarse result, resistor 300 burning, etc. This may be because of the component FALSE. Resistors and capacitors do not really matter. The problem is electrolytic capacitors, Elko. Sorry average Elko Rubycon / Marcon / Nichicon (original) is less suitable to be applied here, because he is more suitable work in the dc current, which is suitable for this is Elko brand Nippon Chemicon (not all), and Elko another stable job at audio frequencies /air conditioning. on paper and table test, but in the power of music, power is transferred to the speaker only a few dozen watts! Proof: cool heatsink / no heat, the sound is loud. Adjust the power speakers with a power amplifier used! Hifi full range with bass gain 2 ~ 4 times the usual amplifier. Effective for the production of such bass amplifier class-h BTL. Speaker leaves more stable, not too advanced and not too far back even if exposed to shocks bass, speakers and power transistor expectations more durable. The values of the components are set such that the power transformer is more efficient. The power transformer is not wasted, not turned into drone / wild signal/oscillation, etc. Yes u can use the 2sc5200 and 2sa1943, its so recomended. 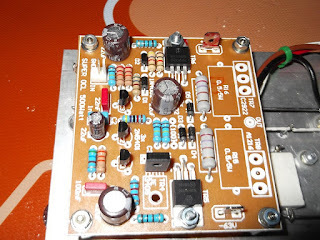 You can find it here about the final amp transistors 5200 and 1943, but it recomend use for room. ok..i found of sanken transistor as 2SC3858 and 2SA1494...is it be use?? For super ocl it greater u using 2sc3858 2sa1949, it can produce more watts with calculating the input voltage and output voltage. but price is high here. can i use only one pair (2SC3858 + 2SA1494). my transformer voltage is 35-0-35 VAC..7Amp...what is it for my transistor have damage? 1 set sanken u...How many watt? hello bro..i am using 1 set sanken transistor. sound is loud. 0.5 ohm 5_watt resistor replace with 0.47 ohm. is it be problem? acutally i not found 0.5 ohm resistor in my city. Hello sanjoy, if there transistor final is hot, you must check the driver, and voltage bias. i see you have not use 100ohm resistor one. in side of diode...i am using it..when i open it,input is going off. 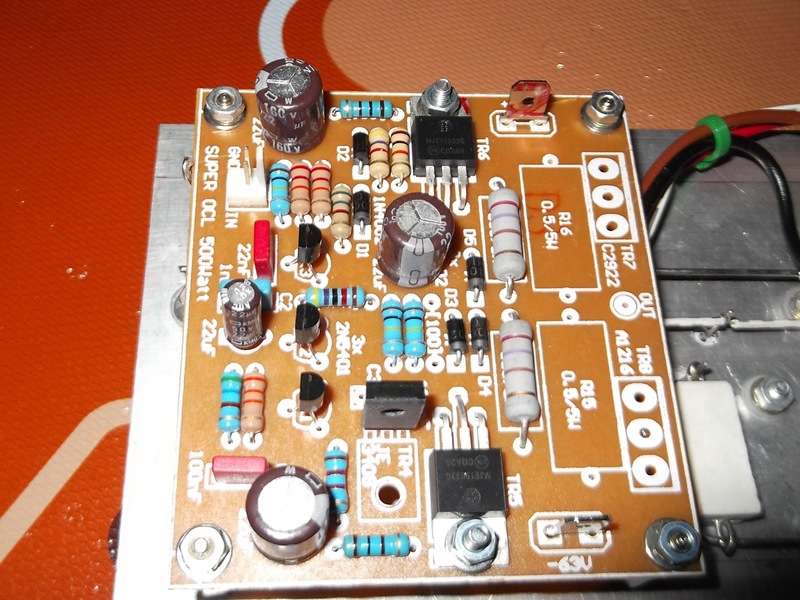 hey bro..I have build it but its giving back the total input voltage on speaker output slot what should i do? sir, can I use TIP35C & TIP36C for this circuit? hola funciona tal y como esta en esta pagina?